It is always preferable (and more affordable) to use the seasonal produce, so I promise you that this wouldn't be the final pumpkin recipe. :-)) So please do bear with me with all my repetitious pumpkin recipes. In the bowl of your stand mixer fitted with a dough hook, stir together splet flour and instant dried yeast. Make a well in the center and add in the pumpkin puree, milk, maple syrup, walnut oil and salt. Mix on the slow speed until all the ingredients blended. Then increase the speed and knead on medium until dough forms. Now lower the speed, and gradually add in the sourdough starter and knead it into the dough, about 2 minutes. Increase the speed and knead until the dough is smooth and elastic in appearance. The sourdough starter here adds extra depth of flavor and moisture, and also speeds the fermentation slightly even in dough using the usual amount of instant yeast. Remove the dough from the bowl and shape into a ball. Grease the mixing bowl with a little walnut oil, return the dough ball, and cover with a plastic wrap. Leave it at room temperature for 1 hour or until it’s doubled in size. Turn out the dough onto a lightly floured work surface. Punch down the dough, knead briefly and cut into two 200 grams pieces and four 160 grams pieces. Shape two 200 grams of dough each into a round and place them in a loaf pan lined with a baking paper. Cover with oiled plastic wrap and proof for 45 minutes until doubled. To make the braid, form each of four 160 grams of dough into strands of about 25-cm in length, tapered so the center of each piece is thicker than the ends. Pinch the 4 strands together at one tapered end. Cross strand 1 over strand 3, strand 2 over strand 3, and strand 4 over strand 2. Repeat until you get to the end of the strands. Pinch all loose ends together. Now pinch two tapered ends together and place it into a 18-20 cm greased springform pan. Cover with oiled plastic wrap and proof for 45 minutes until doubled. Preheat the oven to 190C/375F. Once the dough has doubled, brush the tops of two loaves with well-beaten egg white and sprinkle the poppy or sesame seeds atop. Make a cross on the top of rectangular loaf and bake in the center of the preheated oven for 35 minutes until golden brown. What would AUTUMN be without pumpkin pie, pumpkin bread or pumpkin cheesecake? I like to add nuts to the cheese filling, just to have something to chew on while enjoy the creaminess of the cheesecake. If you prefer yours without, then leave the walnut praline out. The cheese I used for the recipe is called "Quark ©angiesrecipes", a type of fresh cheese, which is made by warming soured milk until the desired degree of denatured proteins and then strained. Quark usually contains much lower fat than the cream cheeses and has no salt added. Feel free to replace it with other type of fresh cheese, like fromage frais or cream cheese. For praline, line a baking sheet with foil. In a heavey skillet place the 100 grams of granulated sugar. Cook over medium-high heat, swirling the skillet occasionally until sugar begins to melt. Reduce heat to low. Stir in the chopped walnuts and cook until sugar is golden brown and walnuts are toasted. Pour the mixture onto the prepared baking sheet, spreading with a wooden spoon as thin as possible. Cool and chop the cooled praline into smaller pieces. Place 1/3 of the chopped praline in a blender container and process until ground. Store them in separate boxes in fridge until ready for use or up to 1 week. For crust, beat butter with an electric mixer on medium-high speed until softened. Add 3 tablespoons of brown sugar and beat until fluffy. Sift in the flour. Beat at slow speed just until combined. Press the dough onto the bottom and 4cm up the side of 9-inch springform pan. Bake the crust in a 190C/375F oven about 10 minutes or until lightly browned. Cool crust on a wire rack while preparing filling. For filling, in a large mixing bowl beat quark cheese, 120 grams of brown sugar, and the flour with an electric mixer on a medium speed until combined. Add the pumpkin, vanilla, cinnamon, ginger, and nutmeg. Beat until combined. Add in eggs and beat on low speed just until combined. Stir in the coarsely chopped walnut praline pieces, reserving the powder for the topping. Pour the filling into the crust and return to the oven. Bake in a 190C/375F oven for 40 minutes or until center appears nearly set. In a small bowl combine sour cream and granulated sugar. Spread over top of cheesecake. Cool cheesecake in pan on a wire rack for 15 minutes. Use a small metal spatula to loosen crust from sides of pan. Cool completely and chill, covered, in the fridge for at least 4 hours or overnight. Just before serving, sprinkle the ground praline over the sour cream topping. Carbonara, an Italian favourite, is a classic pasta sauce usually made with cream, bacon (Guanciale or jowl bacon)and Parmesan (Pecorino will work too) and is absolutely nutritious and delicious. Instead of heavy cream, I used milk for a healthy treat. Well, you wouldn't notice that it's low-fat because it's just as yummy even without using cream. Cook pasta in a large pot of boiling salted water, following packet directions, until just tender. Meanwhile, heat the olive oil over medium heat. Cook diced shallots, minced garlic and bacon for 5 minutes until golden. Beat together eggs, wholemilk, half of grated Parmesan and black pepper. Drain the spaghetti and return to the pot, off the heat. Add in parsley, the bacon and egg mixtures, and toss together until the spaghetti is evenly coated. Divide pasta between two bowls and then serve with the rest of Parmesan cheese. Wholesome cornflakes combined with butter, creme fraiche, and caramel ice cream (summer leftover)makes this cake incredibly delicious! Preheat the oven to 200C/400F. Line a 30x40cm baking tray with paper. Beat the creme fraiche and sugar in a mixing bowl until the mixture is smooth and thickens. Add in eggs, one at a time and beat until fully incorporated. Stir in the ice cream until combined. Gently mix in flour and baking powder, until just combined. Spread the batter evenly into the prepared baking tray and bake in the center for 10 minutes. While the cake is baking, melt the butter, caramel ice cream and caramel sugar syrup in a pot. Turn the heat off and fold in cornflakes. Remove the cake from the oven and spread the cornflake mixture over. Return it to the oven and bake for a further 10 minutes. Autumn is the season for pumpkin recipes. 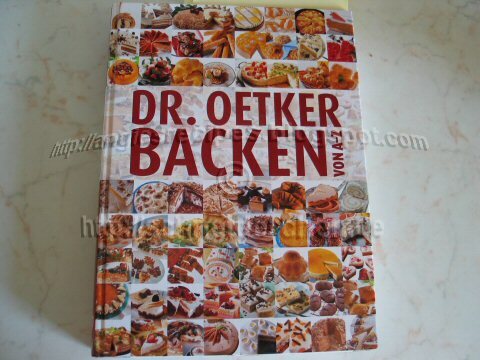 So here is another one, which comes from one of my favourite baking source Dr. Oetker Backen A-Z angiesrecipes. This deliciously soft yeast-risen pumpkin bread is a great alternative to the moist, dense pumpkin quick bread, which is leavened with baking powder or/and baking soda. Cut the pumpkin flesh into small dices. Place them in a pot with water over medium heat. Cook until soft and puree the pumpkin with a blender. First add milk, honey, olive oil, salt and pumpkin puree in the pan of your bread machine. Then add in flour. Make a dry well in the center and add the yeast to the well. Program the bread machine the "Dough" cycle. Scrape the dough out onto a lightly floured work surface and press it down to flatten. 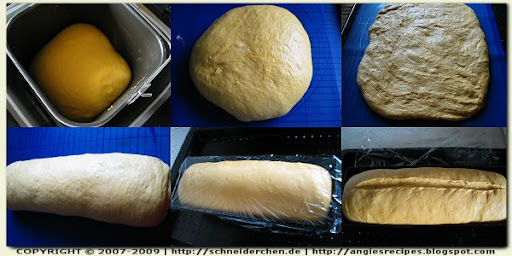 Form the dough into a roll and place into a greased 30cmx11cm loaf pan. Cover and let rise until doubled. Preheat the oven to 200C/400F. Make a 1cm deep slash in the center along the length of the dough. Bake the bread in the preheated oven for 30 minutes. Remove the bread pan and cool on a rack. These pork trotters are really succulent, and truly a delicious combination of sweet, sour, and piquant flavours. Well, it's not everyone's cup of tea as they are high in cholesterol, but I do enjoy them once in a while, you know, in moderation. Blanch the pork trotters in a pot of boiling water. Remove and rinse with cold water. Drain and place them in the inner pot of your electric pressure cooker. Add in shredded ginger, dried chillies, smashed garlic cloves, peppercorns, rice Vinegar, dried haws, Maggi, sugar, caramel colour if used, oyster sauce, chopped spring onion and sherry. Pour in the chicken stock to cover the trotters. Cover and secure with the lid. Plug in the pressure cooker and turn the knob to pork cooking cycle. Once it is done and cools down, then open the lid and transfer the pork trotters into a baking dish. Strain the soup into the baking dish. Bake at 180C/350F for 15 minutes. Sprinkle the top with some spring onion and garnish with a tomato rose if desired. Autumn is in the air. And I like this time of year. Crisp cool air, falling leaves, and the harvest of pumpkins...that's how I conjure up the images of beautiful golden autumn. Pumpkins say AUTUMN like nothing else. Regardless of how you prepare them, they add flavours and seasonal flair to most meals, and moreover, bringing pumpkins to your table is a recipe for fun and togetherness. Let's make this colourful season more memorable with more pumpkins! Preheat the oven to 200C/400F. Place the pumpkin cubes in a baking pan, drizzle with olive oil and season with salt. Toss until the pumpkin cubes are well coated. Roast for about 15 minutes until tender. Divide the rocket salad into two serving bowls, and arrange the chickpeas and roasted pumpkin cubes on top. Combine the argan oil and balsamic vinegar in a bowl, season with salt and pepper, and stir until well-blended. Pour the dressing over and top with the roasted sesame seeds. These wonderfully crinkled black and white cookies have a very brownie-like texture and a stunning high-contrast appearance. They are so easy to bake and taste so good! Preheat the oven to 165C/330F. Line two baking trays with paper. Whisk the spelt flour, baking powder and salt in a mixing bowl. Melt the Mocha chocolate beans and butter in a bowl over a small pan of simmering water until smooth. Cool slightly. Beat the eggs and sugar with an electric whisk until pale, about 2 minutes. Reduce the speed and add the mocha chocolate mix and vanilla extract. Sift in the flour mixture and fold until combined. Cover the bowl with a plastic wrap and chill for 2 hours until firm, or up to overnight. Put the icing sugar in a small bowl. Shape the dough into 32 balls and roll in the icing sugar. Put them on the prepared baking trays 4-cm apart and press down lightly to flatten. Bake for about 12 minutes until the edges set. Let cool on the baking sheets for 5 minutes and then put on a rack to cool completely. And last, sure not the least, I want to thank Alisha and Alison for passing on all these inspirational AWARDS to me! Thanks, my friends, for your continuous support and constant encouragement! 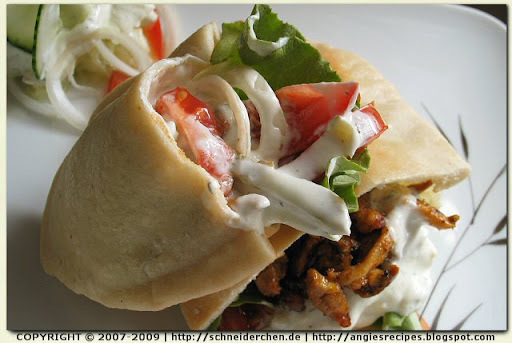 Gyro (yee-roh) is a Greek sandwich specialty. 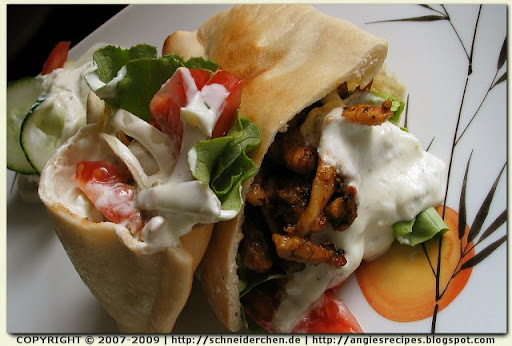 It is typically made of pork meat rolled into a large piece of flatbread or pita. 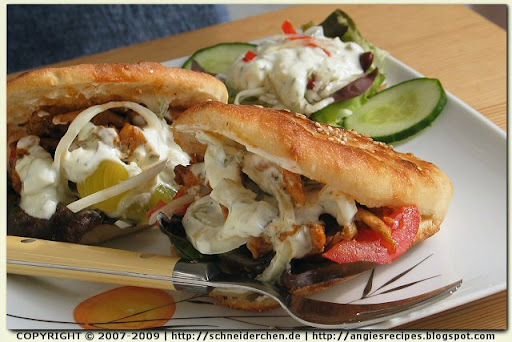 Other versions made with beef, lamb, chicken, and sometimes turkey, are adaptations of the Turkish "Döner Kebap" or "Shawarma", which is a popular fast food across the Middle East and NEVER made with pork. Inside the pita, salad, pickles, hummus and even French fries are added. 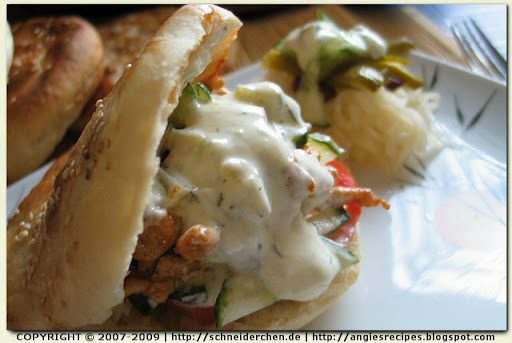 I am sending this to WIN S365s SANDWICH CONTEST!
. Slice the chicken of the grain and add in the seasoning mix. Rub it into the meat with your hands. Cover with a plastic wrap and chill overnight or at least 3 hours. Remove meat from the refrigerator and grill in a roasting pan in the oven until crispy. Or dry fry (without any oil) in a non-stick skillet until browned and slightly crisp. Slice the pita from the top open to create a pocket. If it is a long oval pita, then slice each pita open in half so that it forms 2 small pockets. Gently open the pocket and fill with the tzatziki, salad and meat.